When a Company is relying too much on direct, vertical interaction, among functions or divisions, and the Head, conflicts multiplies. Vertical interaction, according to Ackoff and Gharajedaghi, is typical of an uni-minded organization, where peripheral, or vertical, units, are supposed to execute the directions from the Head, with a limited amount of “local” flexibility. In the real world, this often means that the Head loses touch with the reality of the field, as each vertical unit repprts a filtered view of the business status. Furthermore, competionion develops among internal lines, diverting the energy devoted to competing in the market, towards internal struggles. In the traditional management wisdom, this is often positive, as increases strength of each vertical unit, creates a self-controlling mechanism, and promotes natural selection: weaks are eliminated. In the wide and wild market of the globalized world this is no more true. 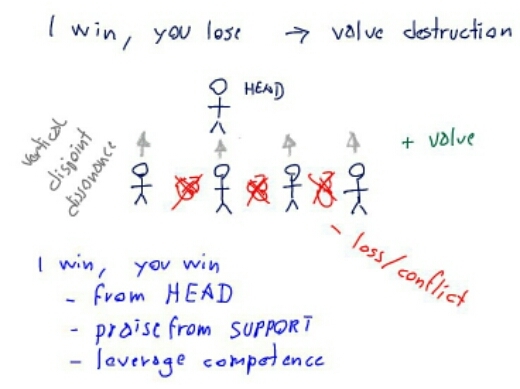 Internal competitors seeks the goal of damaging other internal competitors, creating the conditions that make their competitors’ performance worse. A good top management should be aware of the increasing level of internal competition, putting in place mechanisms that turns this energy in value for the Company. The easiest way is to give rewards to “promoted results”: if your competitor/collegue reaches a result thanks to your support, you receive a bonus, and his bonus will be higher if he acknoweldge this. Such an approach puahes teamworking, and lowers the collaboration barriers across certical organizational structures. The result is an increase in competitive strength, for the Company, in the marketplace. The traditional landscape for Office Automation application has changed significantly. G+, adding a Social platform to the suite. Microsoft, durign the last years, but mainly during the last months, have followed, with an offering that is similar, by some points of view, but different in non trivial details. One Drive offers the cloud storage functionality, integrated with Office apps, with a subset of the traditional PC based Office suite. Yammer: is the Social component, but in an “Enterprise” flavour. Yammer is the result of an acquisition, and is still under “integration” with the other products. Share Point, in the cloud version, is a derivation of the mature on premise product, with a simpler deployment curve. This product offers an unique, structured, platform for file archiving, that doesn’t compete with Drive, or other similar products, like Dropbox or Box, but rather with platforms like Alfresco. Lync, for internet based video/audio communicaton. One Note, is a mature note taking product, that wasn’t able to gain user traction, leaving space for other competitors like Evernote. Now, the two competitors are pushing their marketing efforts toward the rich Business market, and this is the big shift that I have introduced at the beginning, and that each CIO should consider carefully. Significantly, both platforms don’t put a big emphasis on the “mail” component, and both struggle to obtain a good acceptance for their Social apps. The two things are linked, in my opinion: why any Social app require so a big effort, in a business environment, to conquer the user attention and involvement? The answer, I believe, rests in the lack of integration with the mail component. The great part of our daily interaction, at work, comes from mail messages. Managing messages, organizing them, forwarding and processing them, absrorbs the biggest part of the time that we commit to interaction. This is why few minutes are left for engagement in other collaborative platforms, and we are, somehow, scared of being further involved in other things. The solution would be quite simple: integrate mail in the “stream” of posts that populate our social dashboard. This could work well if we are able to organize mail, posts, documents around the big “themes” that we deal with, projects, prospects, processes. An intelligent search mechanism, capable of finding related posts/messages/documents, beside the “natural” linking mechanism provided by hashtags. Another point: the majority of the cloud apps users consider them only as a practical online replacement for the traditional PC versions, enjoying the availability on fixed and mobile platforms. The real time collaboration features are often overlooked. But the ability to work, in real time, by multiple users, on the same spreadsheet or document, while chatting, introduced a new paradigm for collaborative work, that has still a long way to go. Is a social group engaged? When we talk about business or enterprise social networks, we expect to get value out of them from the level and quality of knowledge exchange and interaction. In other words: is there a significant share of the Community posting on the network? Is the content posted interesting enough to engage post readers in replies, comments, discussions? At the end, this is one of the main goals when we establish this kind of software in our company, or when we engage in a public community. the number of Group’s posts and comments reflects the engagement level. This is quite a large Group, with a relevant share of top level professionals. It’s growth rate has been constant over time, but not terrific. Members are mainly located in Italy (single Country). Observing the activity graph above, we can see that the activity is low (one post each few days), and that the ratio of comments/post is low. 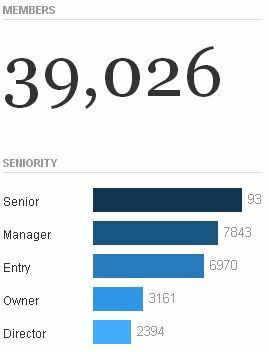 Looking at the Group activity, we see a large share of events announcements, and also that the number of frequent contributors is limited; one of them is the Industry Association itself. The synthesis? This is a a Group that attract people, it’s a communication channel for the owner, but it’s worth looking at it not more than once a week. This is an interesting example. 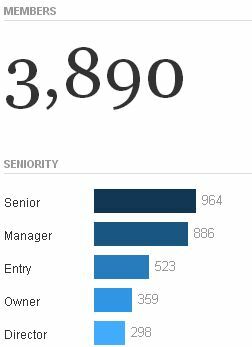 The number of Group’s members is huge, largely in the entry/middle professional levels. The growth rate was impressing, with an average of 2% week on week. The above graph shows an impressive ratio of comments/post that is frequently above 100. 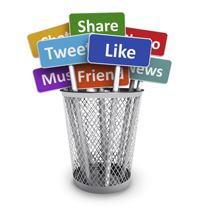 The frequency of posts is not high, an average of one per day. To me, this appear as a successful initiative of the Group’s owner. Some people push forward the discussion, and the topics posted are clearly interesting. We can expect that many members are ready to post their comments because they are happy to show their professional attitude (and this is not bad), but their comments are meaningful, because a lot of other people engage in the discussion. Looking at the posts sequence, we can see that, although there are some top contributors, there is a great number of different people that post to the group. It is really a Group, rather than a showcase. During the last two years, in my company, we have started a series of projects to enhance our SAP ECC platform, in the direction of business integration across the software modules. This happened because we have spotted some limits in the architecture of this ERP system. SAP is a well-integrated software suite, in his main areas (Financial, Logistics, Sales, Real Estate, HR, etc.) it offers a bulk set of functions, that cover the typical business processes in a very wide set of industries. So, where are these limits? I will try to suggest some ideas and discussion topics across the posts of this blog. My company operates in the Construction and Real Estate industry. Our business processes start from the acquisition and development of lands, until the sale of residential properties or the management of commercial properties that are leased out. SAP ECC was installed in late 2005, replacing a previous Italian ERP solution. Initially, SAP was not a successful project. Since 2008, we have started a complete re-engineering of SAP implementation, changing the design from a module/office centric design to a business-centric design. Let’s start now from a small development that we are carrying on now: cash management by an economic business perspective. We have a very basic configuration of the CM module: bank and cash accounts, customers and suppliers accounts, are classified according to categories that are relevant for our business. With these settings, we are able to perform a basic analysis of financial flows; this is important, because our business relies heavily on the financial supplies from banks, and our finance dept. needs to monitor the cash levels versus the financial planning. Unfortunately, the simple analysis of bank accounts doesn’t allow us to understand how the sources and destinations of liquidity have influenced their balances. So we need to drill down this analysis across our business units, and across the development projects that are active. Each area is divided according to the management perspective of the underlying business: residential real estate, as an example, is detailed at building level; several buildings are grouped together according to the land on which they are built. We are simply building a set of reports that allows our financial analysts to separate incoming and outgoing cash flows according to the building, building part, or single controlling-relevant business element that originates the costs or incomes from which the income or payment comes. The key of those reports is a function that, given a cash management relevant posting, goes back to the invoice or other FI document, with a controlling destination, that is paid or collected. I will discuss in some following posts why this solution fits our needs. The point now is the importance to link one area of the ECC system – Controlling – with another area – cash flows analysis, giving the financial analyst a perspective that is the same shared by the financial planners, the production manager, etc. I am playing with an excellent platform for knowledge acquisition and architecting: Protégé from stanford.edu. My main interest is the creation of OWL knowledgebases, and the application of Description Logic. The KISS project is maybe my greatest effort in this area. Protégé is an excellent system for the knowledge engineer, but it is not easy to extract fragment of your ontology in a “user friendly” presentation format. I guessed that a tool like Velocity, from the Apache Foundation, would be a great help, as it allows to create e “template” of your required output, and then fill it at runtime with the java objects from the OWL API. So I written a simple plugin for Protégé, integrating the OWL API and Velocity. The plugin is open source, you can access it from its website. Yes.. more samples can help people without specific programming skills. In the past monts I was really busy, having now the responsibility for two functions; I will do my best to providemore documentation. However, remember that Velocity, the tool at the core of the plugin, was intended primarily as a programming tool; it is based on the Java(TM) object model, so, a non-programmer, will find it a little bit tricky. Modeling standards can be a great resource for System Management. Field Engineers often are more oriented towards “practical” tecniques, underweighting the help that a good model can contribute to a successful management practice. 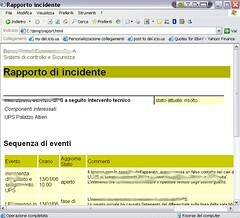 While I was managing Information System, I have worked with the Tivoli suite – from IBM – and developed some modeling tecniques to represent system events and to analyse the requirements for monitorning consoles. There is a paper, describing this, not updated, but perhaps interesting. I published it online after receiving a lot of requests from the Tivoli mailing list. Another approach is described in my recent KISS project – described in another post – where I tried to build a knowledge model of the Information System and the related security and compliance issues. The project uses a Description Logic-based approach for the conceptual modeling of the information system. During the project I have used several new (form me) technologies, like the OWL language, DL reasoners, and I found this approach really fascinating. open source technologies allow innovation with smooth investment curves. The project deliverables are a fundamental tool, in my Company, for Compliance Risk management (according to the Basel Committee definition), and the conceptual models were used as a design input for a commercial application for Compliance management. There is a web page dedicated to the project. You can find also another working paper, on conceptualization of norms, in my website.